Description: coat, Name: Umpak:- Man's black hemp cloth coat, closed front. Front is solidly covered with shell disks. Similiar disks on the back made realistic designs. Cuffs also covered with disks. | Notes: See notes on 128822. These disks are laborously cut out by hand and are often passed by inheritance from on generation to another. Frequently slaves are traded for such garments. 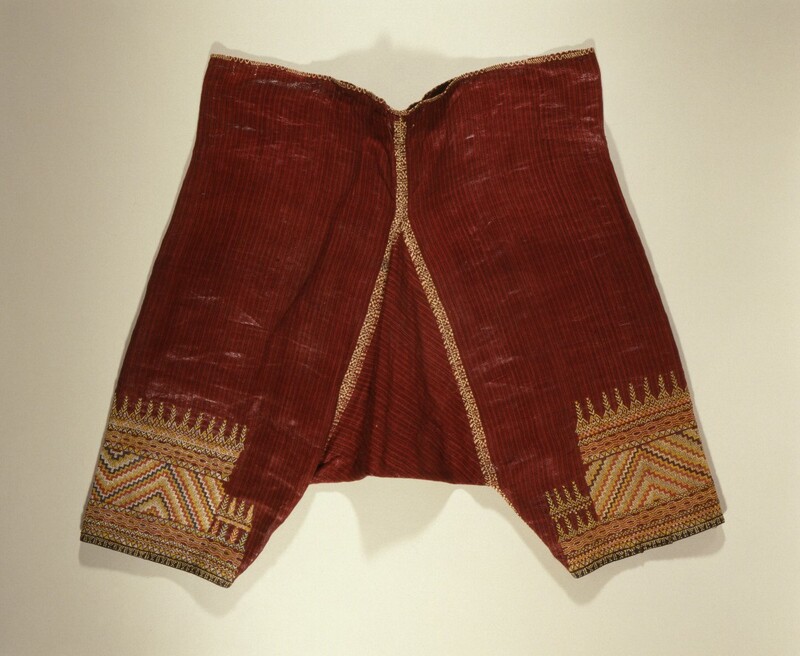 Description: trousers, Name: Salo-al:- Man's red hemp cloth trousers, covered with designs, most of which represent men. Very elaborate. Broad blue bands, on lower parts of legs, are decorated with red and white. 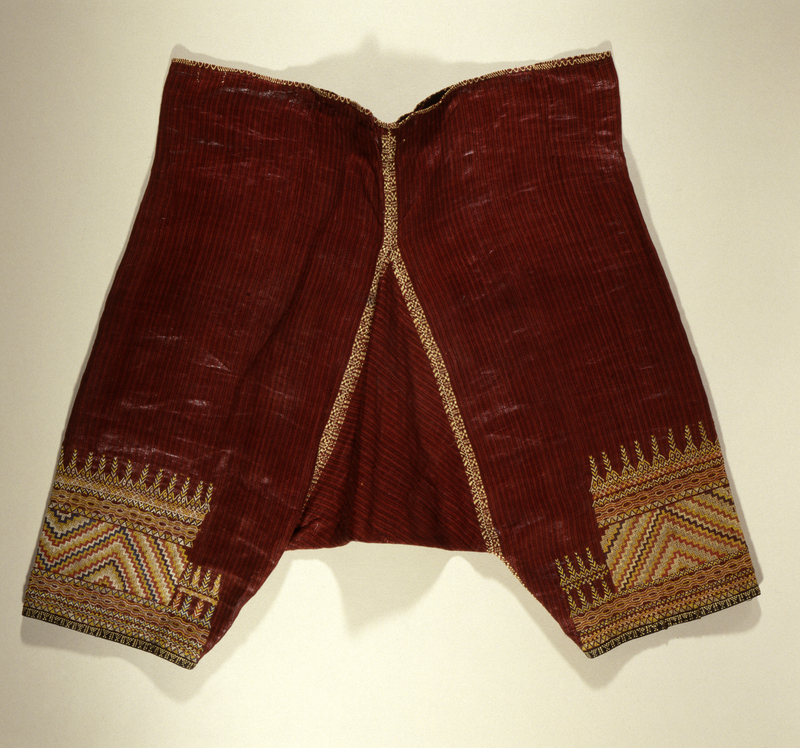 Top of trousers at waist cut in strips. When the cloth is dyed such parts remain uncolored and when thread is removed the white design appears in the cloth. Such clothing i.e. red should only be worn by a mabolot- a man who has killed four or more persons. When he has killed twenty he is known as maiseg and then he can wear a complete black suit. (Black coats, embroidered) are worn by men not maiseg, but they never wear a complete black suit. A person who wears the clothing or ornaments to which he is not entitled will soon become sick and will die. The flower talibanan (Cresta de gallo) is also worn by the successful warriors. Goes with 129645. Description: coat, Name: Sa-ol:- Man's red hemp cloth coat with elaborate designs in white (many realistic figures of men). Blue neckband with few buttons in front of neck. Goes with 129644. When the cloth is dyed such parts remain uncolored and when thread is removed the white design appears in the cloth. Such clothing i.e. red should only be worn by a mabolot- a man who has killed four or more persons. When he has killed twenty he is known as maiseg and then he can wear a complete black suit. (Black coats, embroidered) are worn by men not maiseg, but they never wear a complete black suit. A person who wears the clothing or ornaments to which he is not entitled will soon become sick and will die. The flower talibanan (Cresta de gallo) is also worn by the successful warriors. Description: bundle of abaca fibers, object: Bundles of abacá fibers (manila hemp). Material: Abacá fibers (manila hemp). Description: Bundles of alternating red and tan dyed abacá fibers. Dyed portions are slightly raised due to the dyeing process. Description: bundle of abaca fibers, object: Bundle of abacá fibers (manila hemp). Material: Abacá fibers (manila hemp). 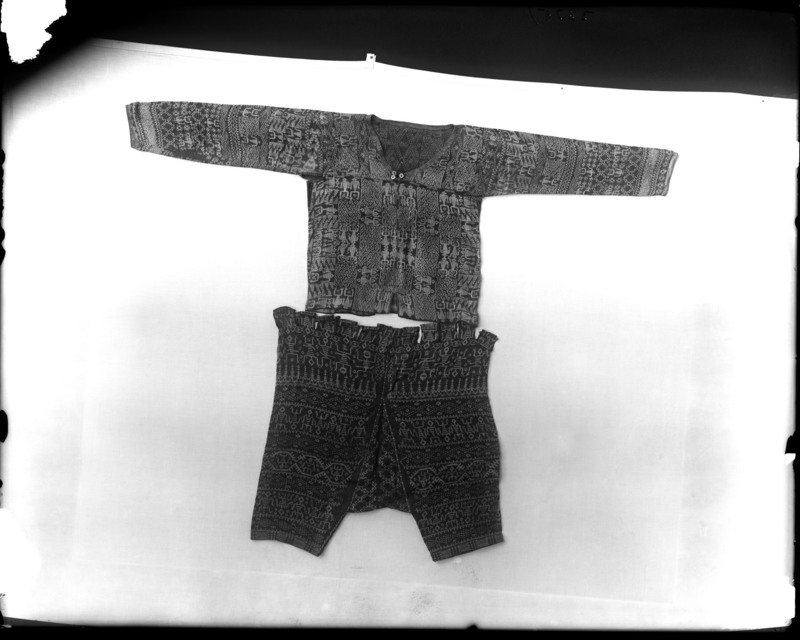 Description: Bundle of coal black dyed abacá fibers (manila hemp). Description: bundle of abaca fibers, object: Bundles of abacá fibers. Material: Abacá fibers (manila hemp). 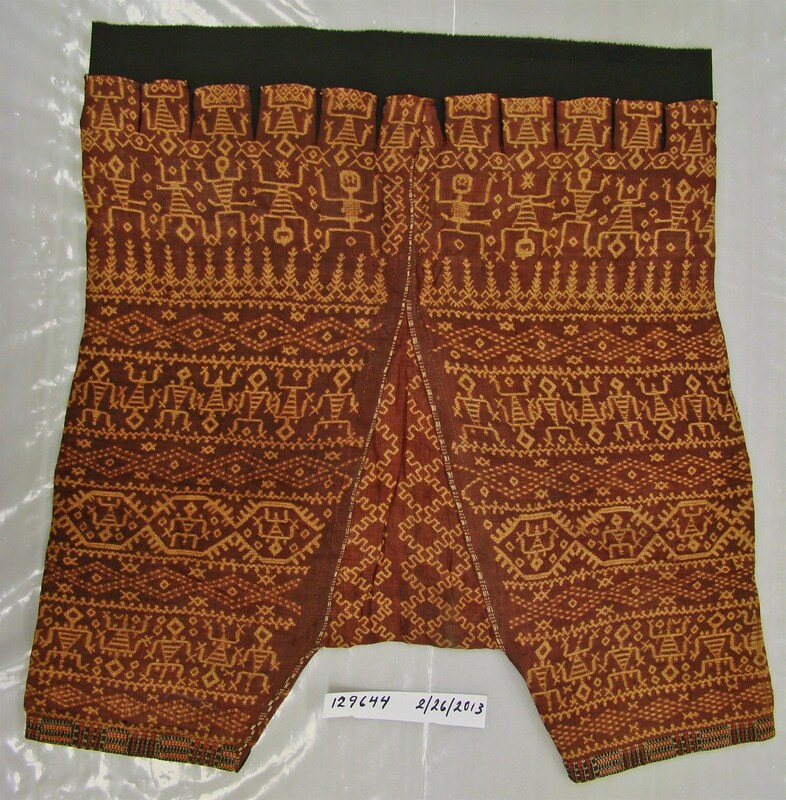 Description: Bundles of alternating black and tan dyed abacá fibers (manila hemp). Description: bundle of abaca fibers, object: Bundles of abacá fibers (manila hemp). Material: Bundle of undyed abacá fibers (manila hemp). Description: A bundle of undyed abacá fibers (manila hemp). 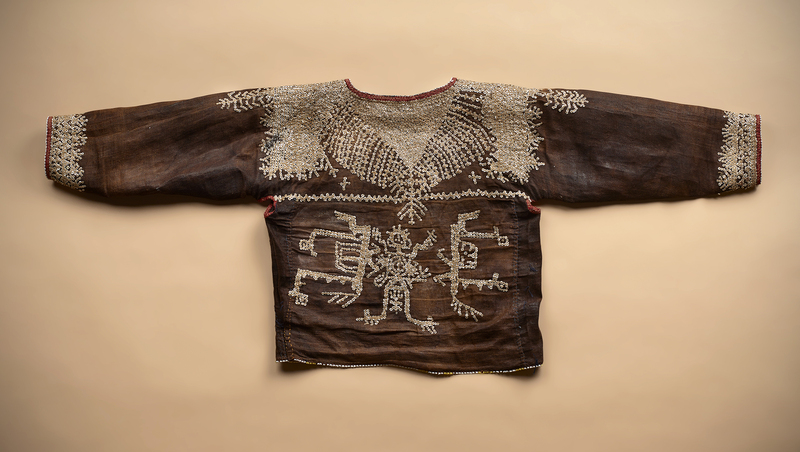 Dark brown fibers are tied around abacá threads to prevent dye from reaching them. Description: bundle of abaca fibers, object: Bundles of abacá fiber (manila hemp). Material: Abacá fiber (manila hemp). Description: Bundles of alternating black and tan dyed abacá fibers (manila hemp). Black portions raised due to dyeing process. Description: man's carrying bag, object: Men's carrying bag. Material: abacá cloth (manila hemp). Description: Square bag of tan and red abacá cloth. Front has panel of pink, blue, red, yellow, white and green glass beads sewn in geometric designs. Straps of braided red and tan abacá appear at either side of bag. Description: carrying box and bag of fragments, Name: Bakotal:- Man's woven carrying box, made waterproof with pitch. On sides are rattan strengthening bands so arranged and marked as to lend decoration. Top rounded. Hemp braid carrying band. 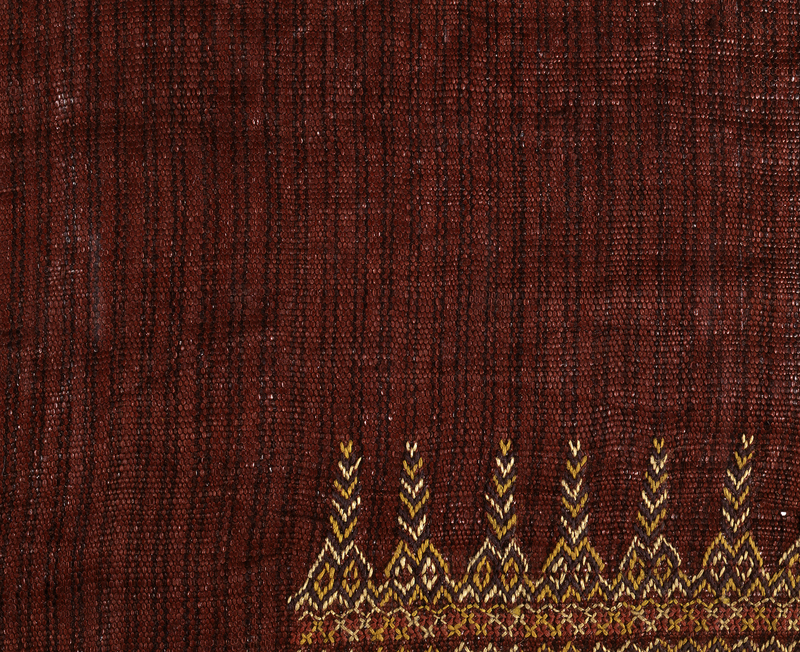 Description: ikat textile, object: Ikat textiles | Material: Abaca plant fiber | Description: Warp ikat fabric. fiber has been pounded with a wooden mallet and rubbed with a shell to make it pliable and shiney. Black-brown background. In natural beige are stylized crocodiles - some with men in their bellies, surrounded by brown-red geometric patterns. Each end has braided fringes. Description: utility bag, object: Utility bag. Material: Woven abaca (Musa textilis) fiber, cotton cloth and trade beads (white). 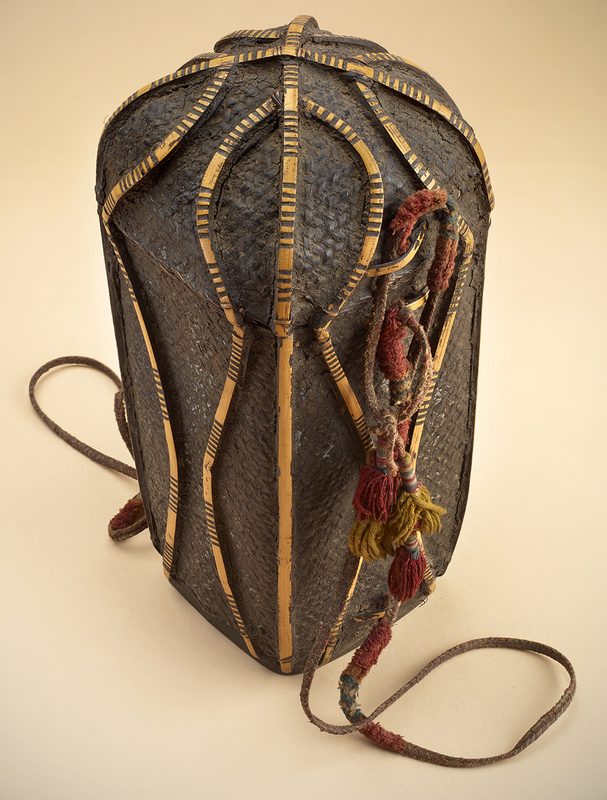 Description: A carry-all bag of dyed and woven abaca fiber and ornamented with the white trade beads and some designs. 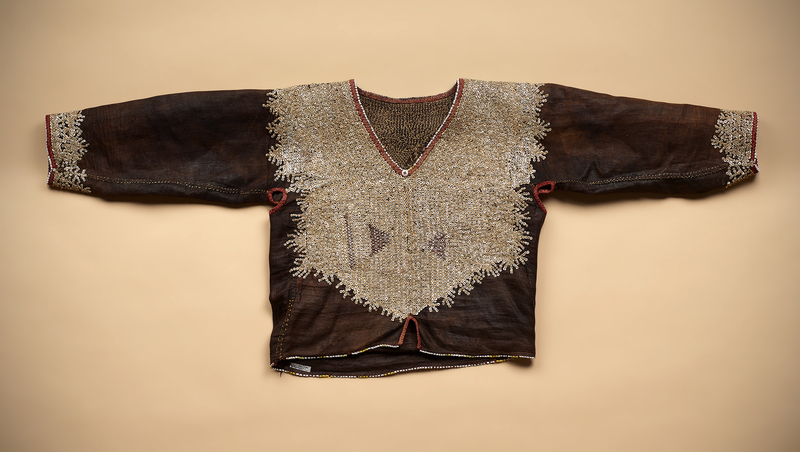 Description: man's jacket, Object: Men's jacket | Material: Woven abaca (Musa textilis) and cotton cloth. | Description: Men's jacket of woven abaca fiber, dyed brown, and interspersed with undyed stripes. Necklines, shoulders, cuffs, and edges ornamented with cotton cloth and designs with colored cotton threads.